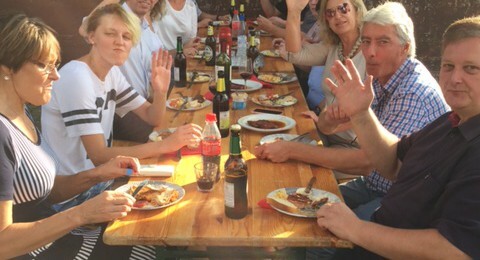 The workforce and management have jointly celebrated the successful past few years at Römer Etikett with a barbecue festival. By installing our first P5-flexo printing end of 2014 we have received and utilized new opportunities in the competitive market of labels. With the acquisition of new customers and numerous new orders, we are looking to extend our capacity to existing and new customers. Merry Christmas and a happy and successful 2016 wishes you your Roemer team! Roemer Etikett looks back on a successful year 2015! With Investments in staff and machinery we could win new customers and extended our business with our suppliers. Thank you very much at both parties involved. The whole team of Roemer Etikett wishes you and your families a happy and peaceful Christmas and all the best for business and private life for 2016! Anniversary at Römer Etikett. Peter Schneider celebrated its 25th anniversary. The company presents him a brazier for his 25 years loyalty. Merry Christmas and a happy and successful 2015 wishes you your Roemer team! Again a successful year for Roemer coming to an end. There has been a lot of positive developments and changes in the right direction in 2014 and this gives us confidence in a very positive outlook for next year! We are pleased that we could get back Mr. Salomka as a flexo printer with high experience. He has worked for the company before until the year 2010. His experience and his teamwork are very valuable for our growing production. Welcome to our team! Römer Etikett proves its longtime quality policy through the acquisition of the certificate DIN EN ISO9001: 2008 for its quality system and the certificate for its HACCP plan.